Matar gazes pensively at the seemingly endless stretch of blue horizon. This is the first time he has seen the sea; when he reaches Trapani, it will be the first time he sees Europe. At disembarkation he will be fingerprinted, receive a basic medical screening, and be questioned as to his origin and intentions, before being hastily delivered to a reception centre. His future in Europe is uncertain. Many migrants like Matar, extracted from the jaws of deflating dinghies by Search and Rescue (SAR) operations, had not intended on coming as far as Europe; they sought a better quality of life and economic opportunities elsewhere. Matar left his home in Darfur, Sudan, to travel to neighbouring Chad, where he dreamed of making money from the gold rush there. 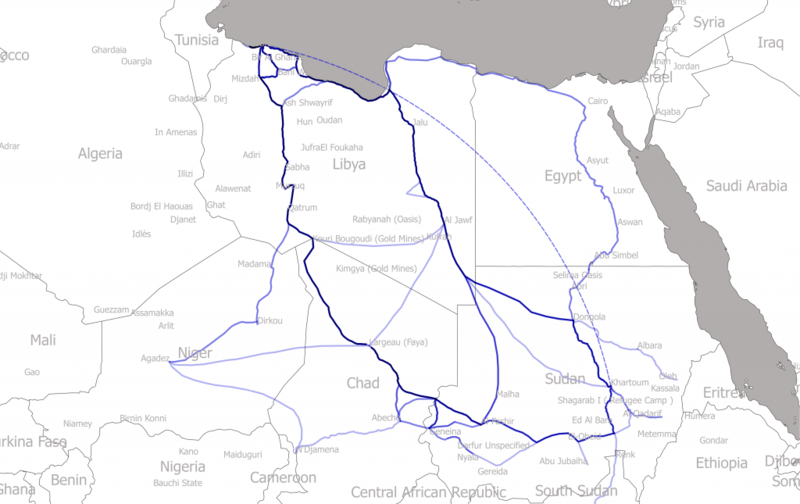 However, his journey took an unexpected turn, causing him to change his original route from Chad, northwards to Libya and Europe. His final route across the Mediterranean Sea from Libya to Italy, is known as the Central Mediterranean route; one of three primary sea routes that irregular migrants and refugees take to Europe. In fact, 80% of irregular maritime migration to Europe occurs here. It is also the deadliest. Matar was more fortunate than the thousands before him who died on this perilous journey. I would never have gone to Libya if I hadn’t been kicked out of the mine in Chad. Due to its long Mediterranean coastline, porous land borders, and the political vacuum left after Colonel Gaddafi’s fall in 2011, Libya has become a hotbed for human smuggling. It is now the primary departure point for refugees and migrants headed to Europe. At the end of 2016, an estimated 700,000 – 1 million migrants and refugees were thought to be inside Libya. The inhumane conditions migrants and refugees face there is well documented. Boarding an unseaworthy vessel seems to many, the safer option. Matar’s journey through Chad has become more frequent for migrants and refugees heading to Europe, particularly for those from Western Sudan and Cameroon. Half of the countries bordering Chad are currently affected by conflict; aside from increasingly being a country of transit, Chad is also hosts to a huge number of refugees hailing from Sudan, Nigeria, and the Central African Republic. With 312,500 registered refugees from Sudan alone, Chad hosts the largest Sudanese refugee population globally. Matar set off from his dusty hometown of al-Geneina, in the Darfur region of Sudan, with a dream of finding the African El Dorado in Chad. Myths had circulated in his hometown of men returning home from there with shining new cars and money to buy a home, pay a dowry, and start a new life. Travelling across the border, Matar yearned for a life different to his own, which had been marred by grinding poverty and disparate economic opportunities. Al-Geneina is the capital of West Darfur State, Sudan, approximately 15 miles from the border with Chad. It is a region wracked with conflict and poverty. The Darfur crisis is now in its 15th year and is one of the largest humanitarian crises in the world. As a result, many Darfurians are forced to seek refuge or better economic opportunities in neighbouring countries. There were many people working in the mine: 21 in total, mostly from Sudan and Chad, and even one guy from Somalia. From 2011-2013, a succession of gold discoveries occurred in the Sahel and Sahara, including in northern Darfur, Libya, Niger, and Chad. Matar headed to Kouri Bougoudi Mine, a large gold mine straddling the border between Chad and Libya, in what many Darfurians consider the safer alternative to the closer Jebel Amir gold mine in Darfur, which has been plagued with security threats and bloodshed. Every day Matar descended a 190m wide hole in the mine with only a rope wrapped around him, his thoughts on the fortune that lay in the ground. He dug the hole himself after he was lent the compressor, which breaks up large rocks to look for gold, from an indigenous Toubou man who ran the mine. The deal was simple: he could keep half of all he found; the other half would be given to the owner of the equipment. Whatever was left over could be sold in southern Libya and Chad, or in the gold fields themselves. In the mine I would think about marriage, a home, and children. During those two years, Matar and other gold prospectors were regularly threatened by both the government and local indigenous groups, over ownership of the mines and surrounding areas. Due to regular -and often armed- conflicts between the gold miners and the local population, as well as an increase in arms and petrol smuggling between Libya and Chad, the Chadian government prohibited gold-mining activities in the region. To stop ‘illegal’ mining, the police would regularly clear out prospectors and close their side of the mine. Matar and a friend from the mine fled after 2 years of work. Concerned that his gold would be stolen from him by the police yet again, he took the 30g of gold he had and stuffed it in his friends left sock. They travelled to Qatrun, Libya, to a gold market where he could claim his fortune and return to Sudan. When I found the gold the first time, I wished to go back to Sudan to begin a new life. In Qatrun, Matar received a disappointing 7000 dinars (approximately 5,100 USD) for his last two years of work. Stood in the dusty Qatrun gold market, without enough money to return home and build a new life, he had few options but to travel the same way everyone else was going: north. After finding himself many miles away in Libya’s capital, Tripoli, Matar paid 1,500 Libyan Dinars (approximately 1,100 USD) to smugglers to take him to the Sabratha coast and on to Europe. A matter of days later, he was herded on board a dinghy with other nervous migrants with no fuel, food, or water. Daybreak would come soon, bringing with it the heat of the morning sun, but also hope. The Migrant Voices of the Mediterranean series records stories from those Xchange encountered during their research onboard the MOAS Phoenix vessel during 2017, as part of the Central Mediterranean Survey: Mapping Migration Routes & Incidents. Read the full report here. Disclaimer: All names of persons in the Migrant Voices of the Mediterranean series have been replaced with pseudonyms to preserve the migrants’ anonymity. The other two routes are via the Eastern Mediterranean route from Turkey to Greece and the Western Mediterranean route from Morocco to Spain via the Alboran Sea, or the the Canary Islands.